Welcome to Winter Wonderland. Brrrr…isn’t it cold in here? But it’s also filled with festivities, snow days, mugs of hot chocolate…and cute treats like these Three Easy Christmas Cupcakes! Aren’t these adorable? I bet all kids and adults would love these cupcakes. 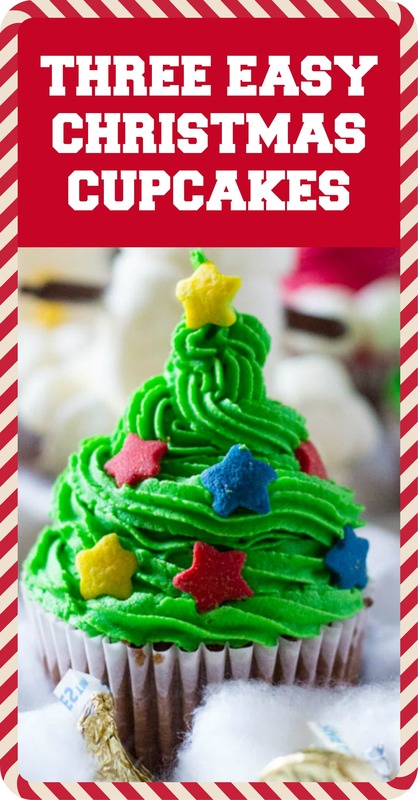 And these Three Easy Christmas Cupcakes are so simple, that you can probably have your kids help you with making them. Woohoo, for kitchen help! Although…on second thought…good luck cleaning up if you have small ones in the kitchen…LOL. Okay so let’s come to the making of these three easy Christmas Cupcakes recipe. 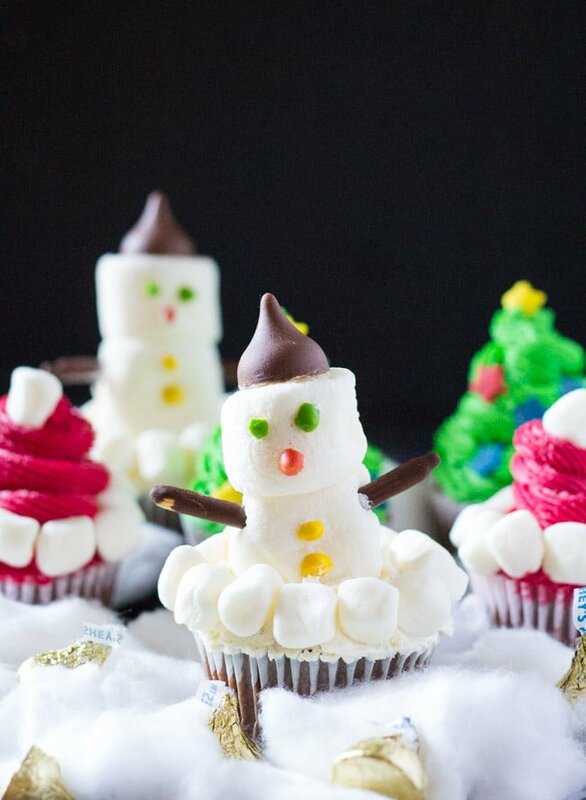 Since we are focusing on three different kinds of cupcakes ideas: Santa Hat Cupcakes, Christmas Tree Cupcakes and Snowman Cupcakes, I’m going to go through the instructions for each kind of Christmas cupcake idea one by one. To make everything easy, I used a chocolate boxed cake mix. The recipe is written for 12 cupcakes and yields four of each kind of cupcake. So if you follow the recipe as written, you will make four Santa Hat Cupcakes, four Christmas Tree Cupcakes and four Snowman Cupcakes. If you want you can double the amount of cupcakes, but then also remember to double the amount of buttercream and other ingredients accordingly. If you make the buttercream as written in the recipe instructions, you will then have to divide it into three parts. 1 1/2 cups each for red and green frosting (for the Santa Hat and Christmas Tree cupcakes), and 1/2 cup for white frosting (for the Snowman cupcakes). Okay now let’s talk about each individual cupcake one by one! These Santa Hat cupcakes are not only adorable, but they are also one of the easiest cupcakes I’ve ever decorated. 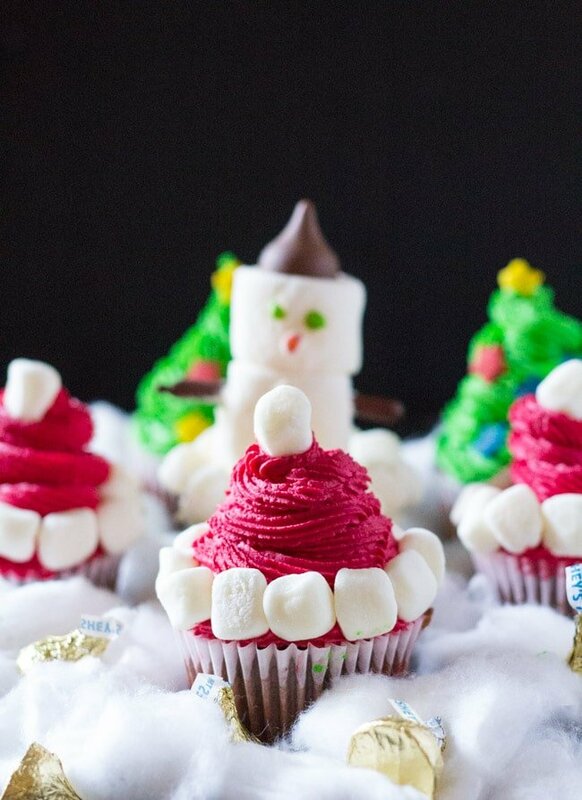 All you need is red buttercream frosting (see the recipe below) and mini marshmallows to make these adorable cupcakes. One you’re done piping, just pop mini marshmallows on the peak of the ‘santa hat’ and also around the edge of the cupcakes. 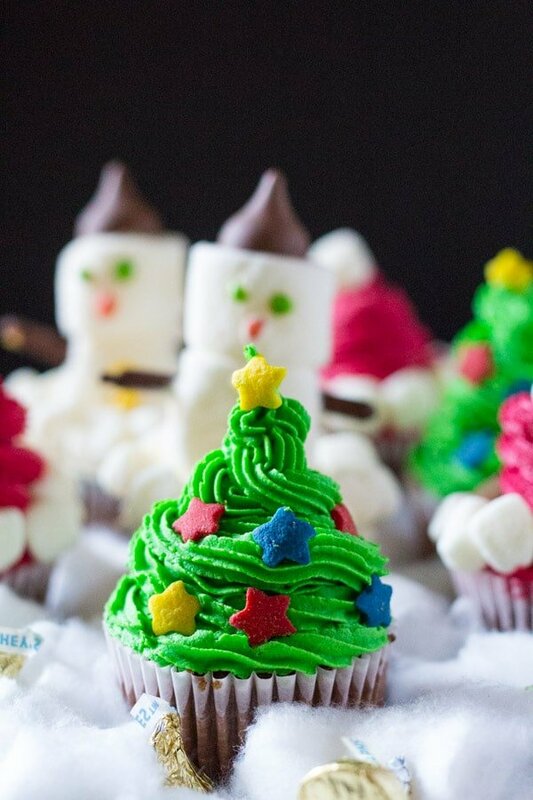 These Christmas Tree cupcakes are as easy and as pretty as the Santa Hat cupcakes. For these cupcakes you need green buttercream frosting (see the recipe below) and the Wilton piping tip 22. Just fill a piping bag with the green buttercream frosting, and pipe in a swirly motion onto the cupcake, starting from the outer edge, making sure you build the icing so that it increases in height and then ends in a peak. I think these are probably my favorite out of all three, but it’s kinda hard to choose! Okay out of all three kinds of cupcakes, these are the most fiddly ones and take some effort. But take it from me, these aren’t really that hard, and still pretty easy. You will start with a cupcake that you will frost with white buttercream frosting (see recipe below). 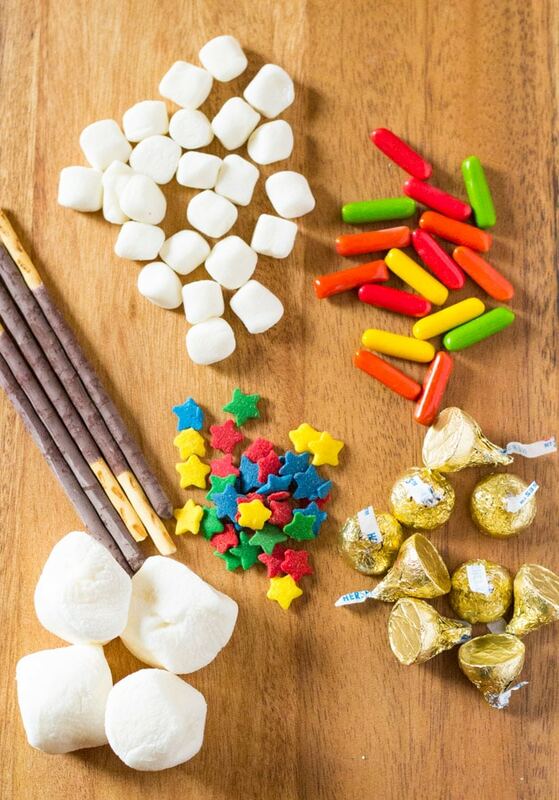 To make the snowmen, you will need regular sized marshmallows and Hershey’s kisses and toothpicks. To assemble the body of the snowman, you will need to skewer together the Hershey’s kiss and two marshmallows with a toothpick. This is to ensure that the snowman doesn’t fall apart when you place it on the cupcake. For the eyes, nose and buttons, I used the long rectangular candies you see in the picture above. I cut the corners to make the features and buttons of the snowmen. For the sticks, I used chocolate sticks/pocky sticks (see picture above), and basically just broke them into small ‘arms’. To secure the features, buttons and arms, I basically used a bit of white buttercream frosting to glue them onto the snowmen. You may have to push in them in a bit, because otherwise they might fall apart. And as a last step, I just dotted the edge of the cupcake with mini marshmallows to give a finished look. Note: This post was originally published on November 22 2016. A tutorial on how to make three easy christmas cupcakes that are so simple to make and perfect for the holidays! With a handheld mixer or stand mixer, beat the butter on medium speed until it is pale and creamy - this will take about 2-3 minutes. Add 4 1/2 cups of confectioners' sugar, cream. and vanilla extract with the mixer running on low speed. After the ingredients are combined, increase the mixer speed to high and beat for 3 minutes. If your frosting is too thin, add an additional 1/2 cup of confectioners' sugar. Since we need to pipe this buttercream high onto the cupcakes, it needs to be on the stiff side so that it is easily piped and holds its shape. However, if you feel the frosting is too thick or stiff, then you may add a bit more of heavy cream starting with 1-2 tablespoons of heavy cream. Once the buttercream is ready, divide it into three bowls. 1 1/2 cups of the buttercream frosting for the green frosting (for the christmas tree cupcakes), 1 1/2 cups of the buttercream frosting for the red frosting (for the santa hat cupcakes) and1/2 cup of buttercream frosting for the white frosting (for the snowman cupcakes). I used Wilton red, green and white food color gels to do this (see above to see the exact names of each color in the equipment list). Each took a few drops of food coloring to reach the colors you see in the pictures. You can adjust the amount of the food color depending on what shade you want. 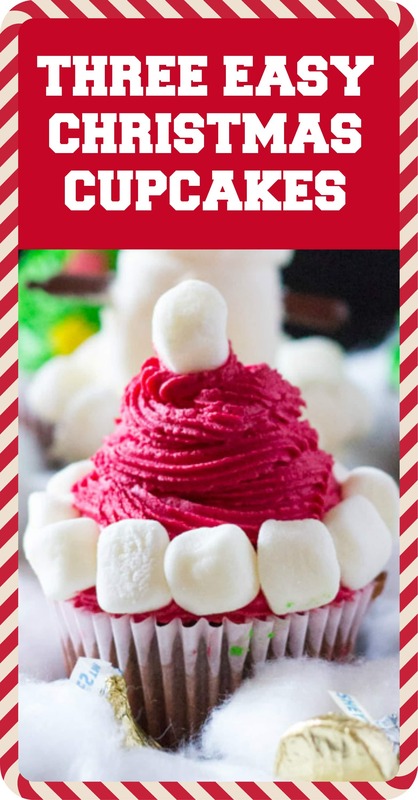 Fill a piping bag with the red buttercream frosting and pipe in a circular motion starting at the outer edge of the cupcake (building height of each swirl as you pipe) until you reach the desired height of your santa hat. I used the Wilton piping tip 32. Top the santa hat with one mini marshmallow, and place mini marshmallows around the edge of the cupcake to make the santa hat border. Fill a piping bag with the green buttercream frosting and pipe in a circular motion starting at the outer edge of the cupcake (building height of each swirl as you pipe) until you reach the desired height of your christmas tree cupcakes. I used the Wilton piping tip 22. Decorate the christmas tree cupcakes with the candy stars. Ice the cupcakes with a thin layer of white buttercream frosting. I used a butter knife to ice these cupcakes. Place two regular sized marshmallows on top of each other, and then place a Hershey's kiss on top (as the hat), and gently push a toothpick through the bottom marshmallow, so that it goes through the second marshmallow, and into the base of the hershey's kiss. This will help ensure that the snowman doesn't fall apart. Cut 2 corners of one green candy to make the green eyes. Cut one corner of the orange candy to make the orange nose. Cut 2 corners of the yellow candy to make the two yellow buttons. 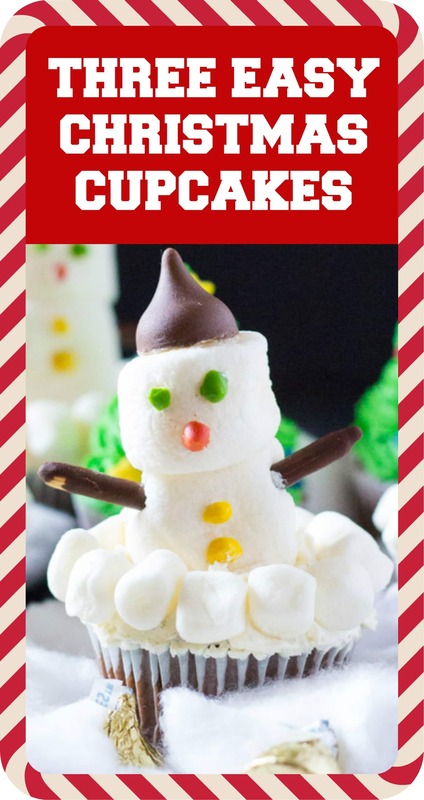 Using a toothpick, add some icing on the back of these candy pieces, and gently press them into the marshmallow to make the snowman features. Now break the chocolate/pocky sticks into little 'arms', and using the frosting, place them on the side of the bottom marshmallow to make the arms. Now to place the snowman onto the cupcake, I like to insert another toothpick into the bottom of the snowman, and then insert it onto the cupcake, so that the snowman stays fixed and doesn't topple off. Lastly, place mini marshmallows around the edge of the cupcake. This recipe is written for 12 cupcakes and explains how to make 4 cupcakes of each style i.e. this recipe yields 4 Santa Hat Cupcakes, 4 Christmas Tree Cupcakes and 4 Snowman Cupcakes. If you want to make more cupcakes, then you can use 24 cupcakes and double the rest of the ingredients for the buttercream and decorations. And similarly if you want all Santa Hat Cupcakes OR all Christmas Tree Cupcakes OR all Snowman Cupcakes then simply just tint the buttercream frosting whichever color is appropriate for your choice of cupcake style and increase the amount of the decorative ingredients accordingly. These cupcakes are adorable! Well done, and so cute! These are so stinking cute! Love these! Everyone of these cupcakes are adorable! Too, too cute! 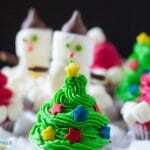 I absolutely love the Christmas tree cupcake, I’m going to make it for my church’s Christmas kickoff. This is creative! So festive and fun! Where can I find the little candy stars to decorate the Christmas Tree cupcakes? Hi Sandy, I found the little candy stars at Wilton but I think you may be able to find it at other stores which have baking supplies and sprinkles!